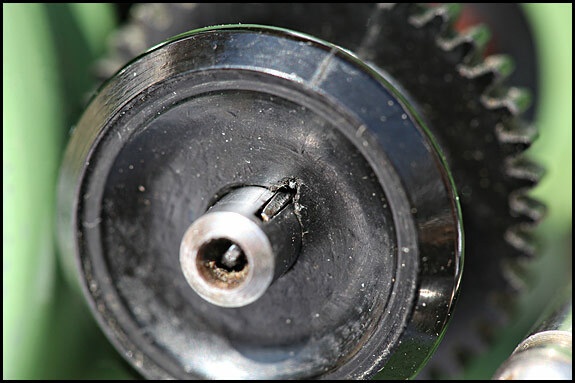 One of the very first things I ever learned about Grasshoppers was that you must never go near the hook/bobbin case area with sewing machine oil. 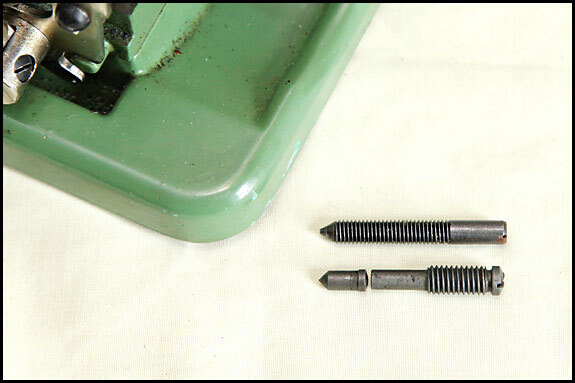 Naturally I asked why not, and was told that sewing machine oil was too thick. It would slow the machine down. Oh really? So what, pray, was a person to use instead? “Petrol” was the answer. Which made no sense at all to me – even when it was explained that (a) petrol was what it says in the instruction book and (b) it wasn’t a problem in practice because a can of lighter fuel lasts for ages. 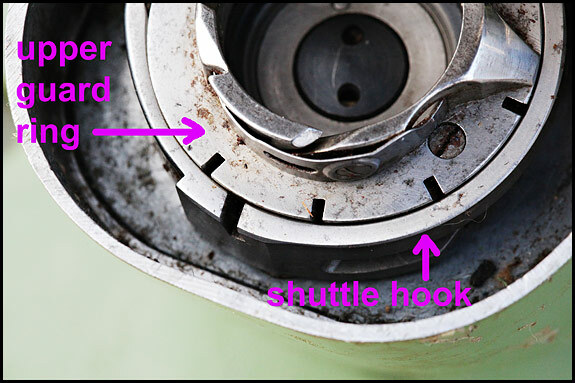 And lest there be any doubt about that, on the previous page under “Maintenance of the Machine” it says (in German, of course) that before each use, “the shuttle should be lubricated with 2-3 drops of petrol”. So my informant was right. Or was he? 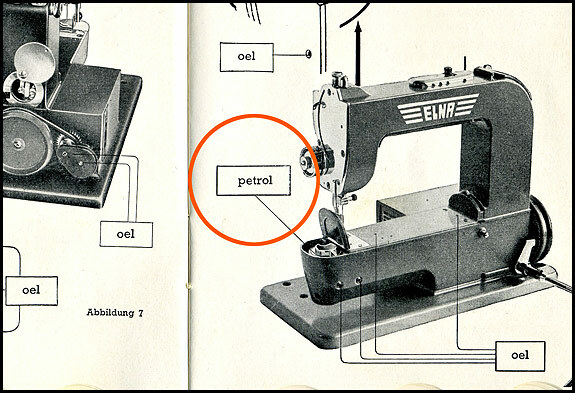 Yes, Tavaro did seem to recommend sewing machine oil for everywhere but the shuttle – but petrol still made no sense at all to me. 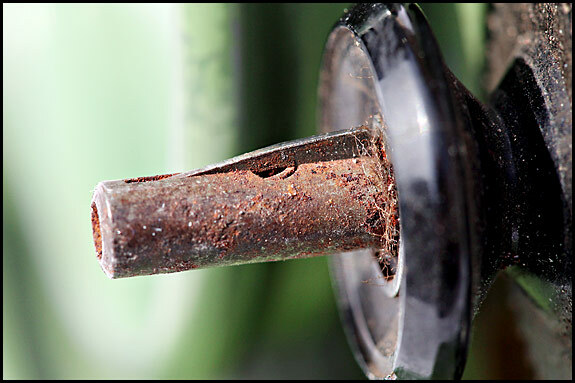 Petrol’s a lousy lubricant. And besides, what does it say on petrol pumps in Germany? Yep, it says “Benzin”. Now, if you go into Google Translate or Babel Fish or whatever with “pétrole”, what do you get? That’s right – you get “oil”. 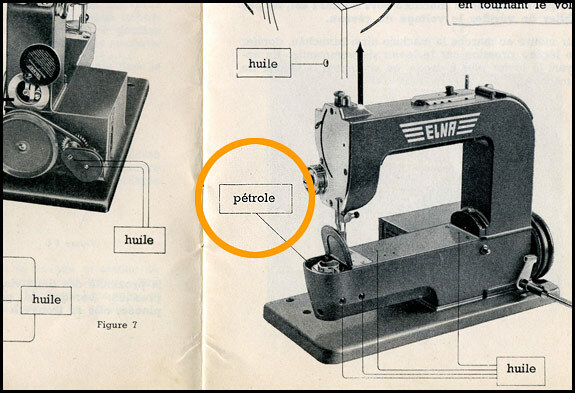 But that’s only part of the answer, because whilst it’s true that, for example, “une lampe à pétrole” is an oil lamp, that doesn’t mean oil as in sewing machine oil, it means oil as in lamp oil. Which is a close relative of paraffin! And sure enough, no sooner had I concluded that Tavaro meant the shuttle to be lubricated with paraffin, than I discovered that in the US-market Grasshopper instructions, it doesn’t say “gasolene”, it says “kerosene”. Or paraffin. This of course raises the question “why paraffin?”. 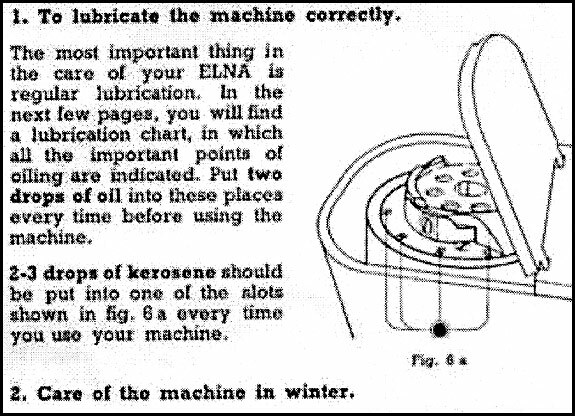 Given that paraffin has no magical properties at all, my guess is that Tavaro simply wanted any lubricant for the shuttle which had a lower viscosity than ordinary sewing machine oil, and the only thing which was readily available at a reasonable price in most of the Western world 70 years ago was paraffin. 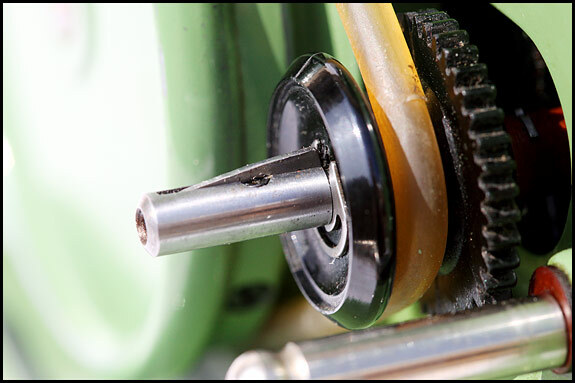 It’s not much of a lubricant, but it’s better than none and it does creep into very small gaps even better than sewing machine oil does. 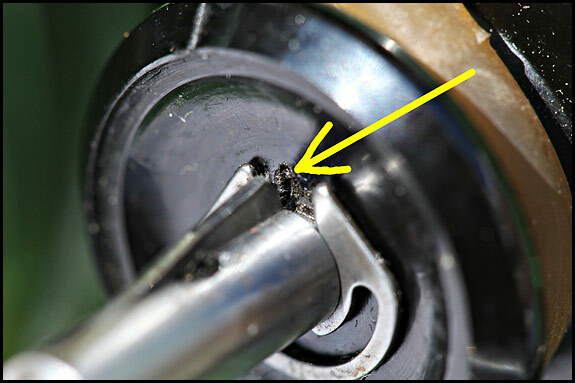 Sorry about the quality of that scan from a print of a dodgy PDF, but hopefully you can see that the idea is to put 2-3 drops of kerosene down one of the slots in what Tavaro called the Upper Guard Ring, before each use of the machine. 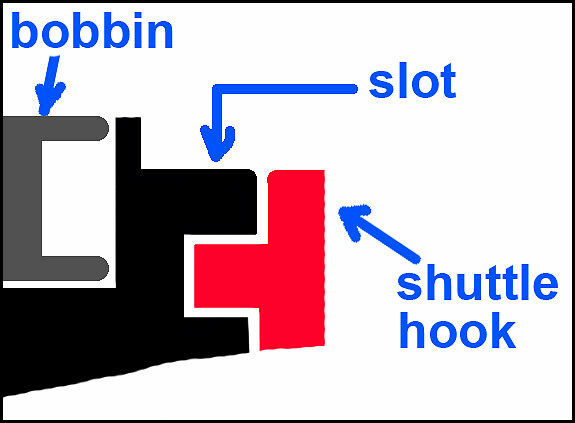 In that much-simplified diagram, the red bit is the shuttle hook and the black is what on most other machines is called the bobbin case, on the top of which are to be found those slots. 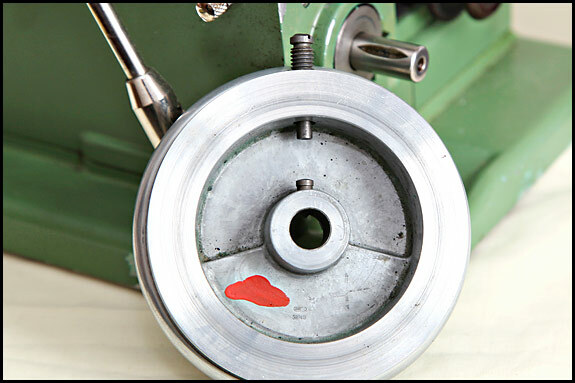 When you’re sewing, the bobbin case stays put and the shuttle hook whizzes round and round it at a fair old speed, so you can see that it would be a good idea if that very narrow gap between the two parts was lubricated. 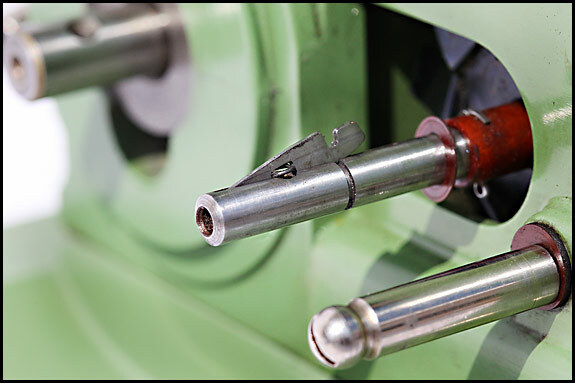 And that’s what you’re aiming to do with your 2-3 drops before each use – get them to creep into that gap, and hopefully stop the parts wearing against each other. But what lubricant to use nowadays? Well, not WD-40, that’s for sure. 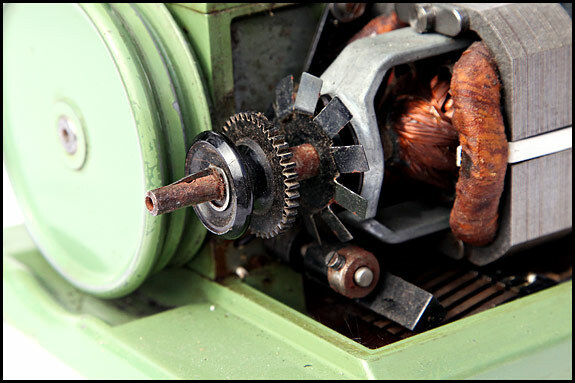 You might just as well use paraffin – or even diesel if you can handle the smell. Clock oil would probably be good, but you should see the price of it! 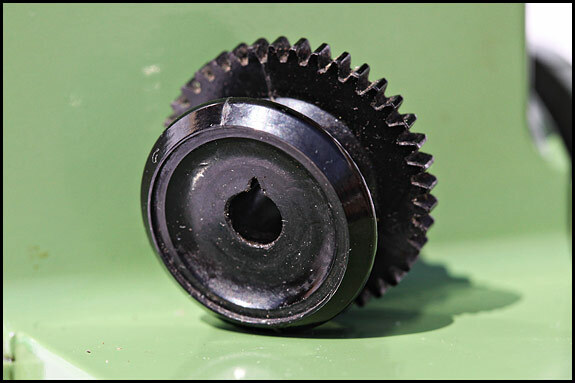 Actually, any modern low-viscosity automatic transmission fluid would do the job, and seeing as how you wouldn’t need to apply it every time you use the machine, you could probably scrounge enough to last you several lifetimes from wherever you get your motor car serviced. 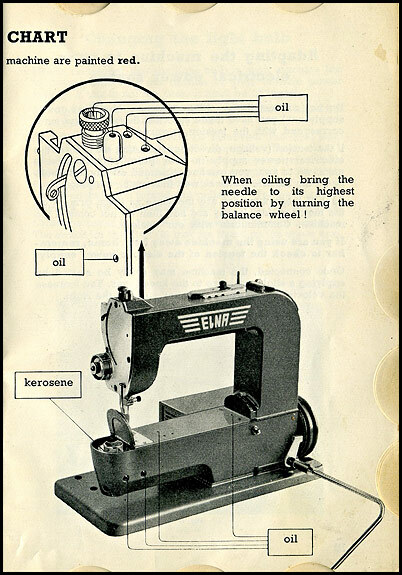 In the end though, I’ve settled on Tri-Flow Oil from the US of A despite, rather than because of, the way in which it’s relentlessly promoted at every opportunity by its many fans on US sewing forums. It’s a very thin oil with good penetrating properties, it has PTFE in it (so you really do need to give it a good shake before applying it) and it doesn’t stink, so for the time being at least, that’s what I’m using. 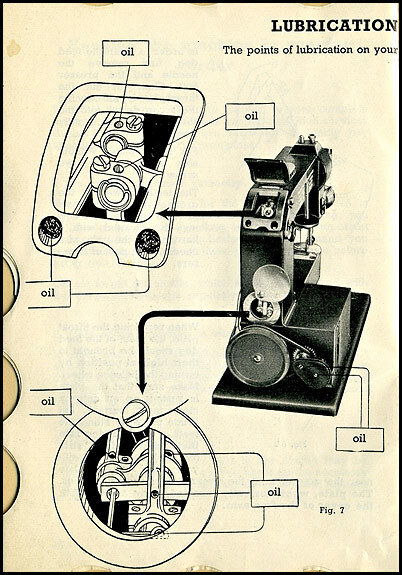 What I’d love to know, though is this – has anybody actually tried dropping good quality modern sewing machine oil down those slots and tested whether or not it really does slow down the machine?